I will post information on ISBA 8 sesions today as I see them on Twitter (see programme in PDF, and sessions from yesterday). 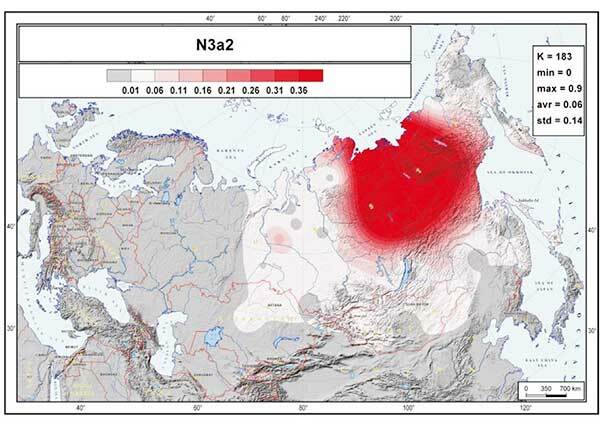 Exploring the genomic impact of colonization in north-eastern Siberia, by Seguin-Orlando et al. NOTE: For another interesting study on Yakutian tribes, see Relationships between clans and genetic kin explain cultural similarities over vast distances. 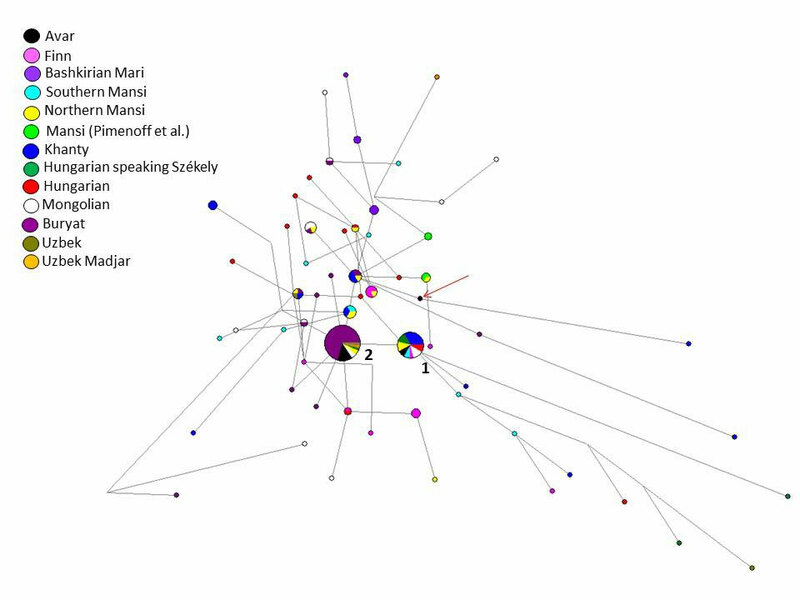 Using ancient DNA to identify the ancestry of individuals from a Medieval trading centre in Northern Finland, by Simoes et al. Analyzing genomic information from archaeological human remains has proved to be a powerful approach to understand human history. 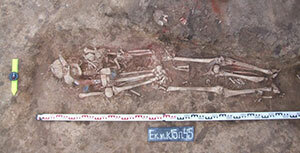 For the archaeological site of Ii Hamina, ancient DNA can be used to infer the ancestries of individuals buried there. Situated approximately 30 km from Oulu, in Northern Finland, Ii Hamina was an important trade place since Medieval times. 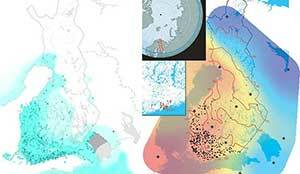 The historical context indicates that the site could have been a melting pot for different cultures and people of diversified genetic backgrounds. Archaeological and osteological evidence from different individuals suggest a rich diversity. For example, stable isotope analyses indicate that freshwater and marine fish was the dominant protein source for this population. However, one individual proved to be an outlier, with a diet containing relatively more terrestrial meat or vegetables. The variety of artefacts that was found associated with several human remains also points to potential differences in religious beliefs or social status. In this study, we aimed to investigate if such variation could be attributed to different genetic ancestries. Ten of the individuals buried in Ii Hamina’s churchyard, dating to between the 15th and 17th century AD, were screened for presence of authentic ancient DNA. 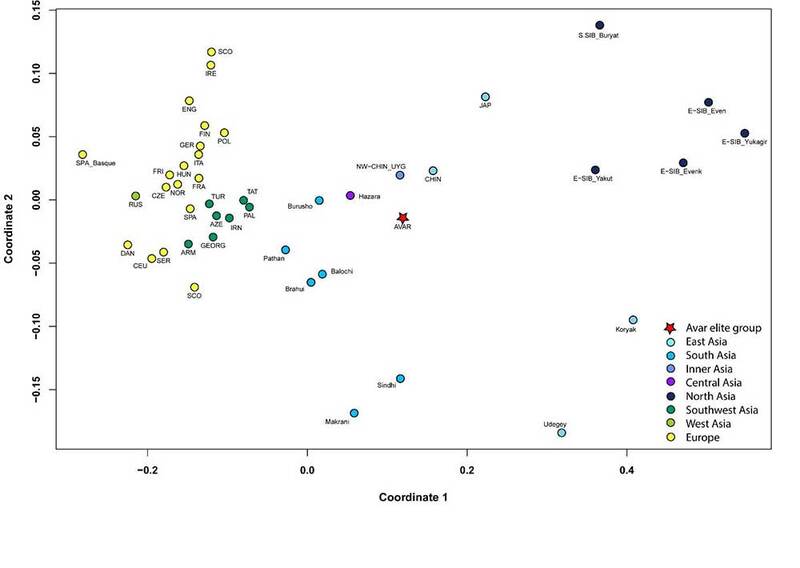 We retrieved genome-wide data for six of the individuals and performed downstream analysis. Data authenticity was confirmed by DNA damage patterns and low estimates of mitochondrial contamination. The relatively recent age of these human remains allows for a direct comparison to modern populations. 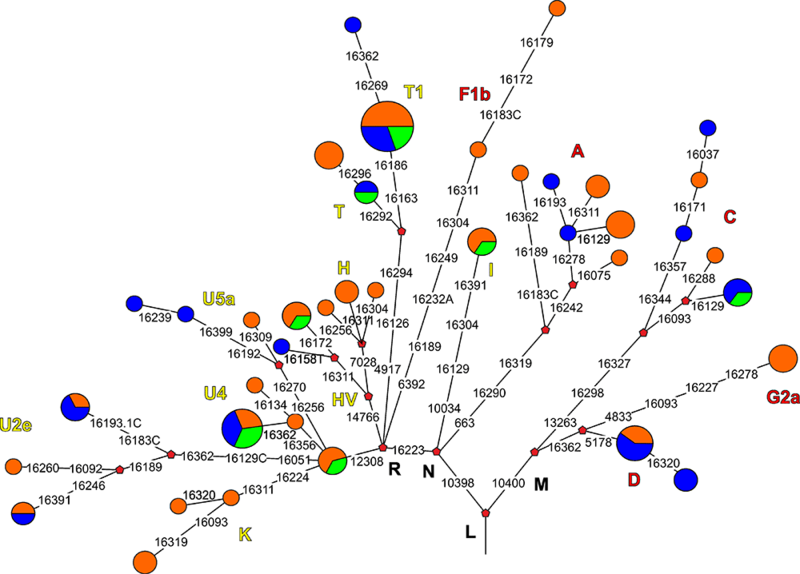 A combination of population genetics methods was undertaken to characterize their genetic structure, and identify potential familiar relationships. 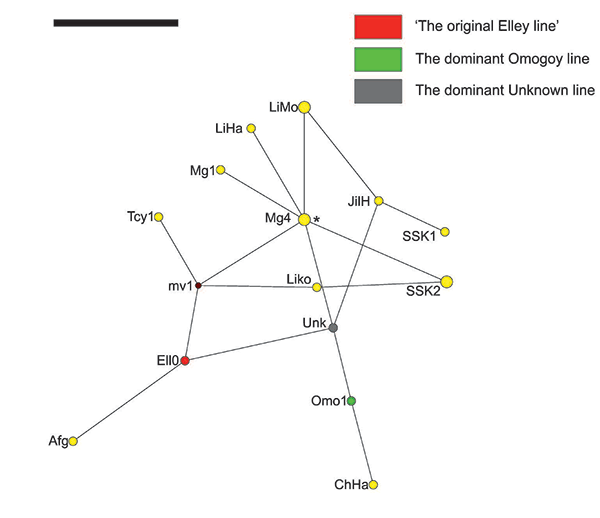 We found a high diversity of mitochondrial lineages at the site. 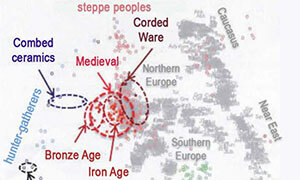 In spite of the putatively distant origin of some of the artifacts, most individuals shared a higher affinity to the present-day Finnish or Late Settlement Finnish populations. Interestingly, different methods consistently suggested that the individual with outlier isotopic values had a different genetic origin, being more closely related to reindeer herding Saami. Here we show how data from different sources, such as stable isotopes, can be intersected with ancient DNA in order to get a more comprehensive understanding of the human past. 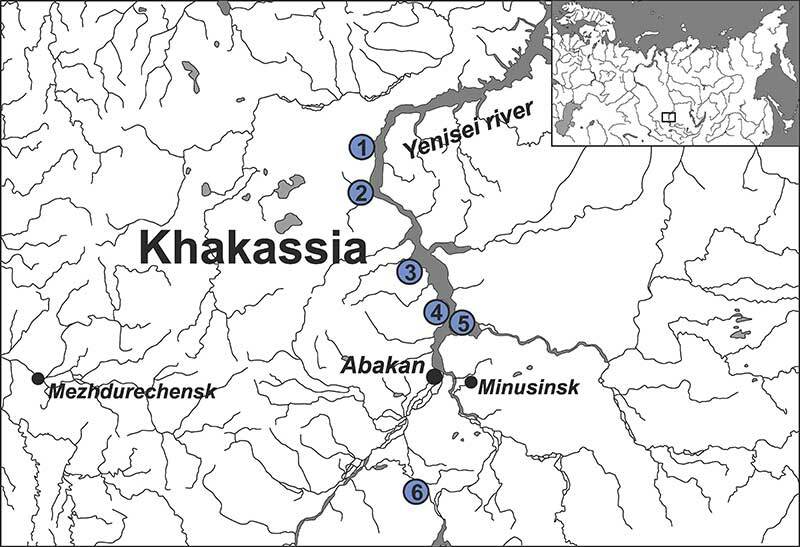 Multiple criteria for the detection of plant resources processed in hunter-gatherer pottery vessels from the Upper Volga, Russia, by Bondetti et al. 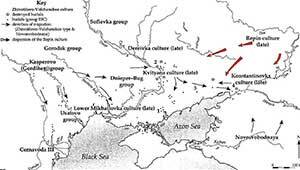 In Northern Eurasia, the Neolithic is marked by the adoption of pottery by hunter-gatherer communities. The degree to which this is related to wider social and lifestyle changes is subject to ongoing debate and the focus of a new research programme. The use and function of early pottery by pre-agricultural societies during the 7th-5th millennia BC is of central interest to this debate. Organic residue analysis provides important information about pottery use. This approach relies on the identification and isotopic characteristics of lipid biomarkers, absorbed into the pores of the ceramic or charred deposits adhering to pottery vessel surfaces, using a combined methodology, namely GC-MS, GC-c-IRMS and EA-IRMS. However, while animal products (e.g., marine, freshwater, ruminant, porcine) have the benefit of being lipid-rich and well-characterised at the molecular and isotopic level, the identification of plant resources still suffers from a lack of specific criteria for identification. In huntergatherer contexts this problem is exacerbated by the wide range of wild, foraged plant resources that may have been potentially exploited. Here we evaluate approaches for the characterisation of terrestrial plant food in pottery through the study of pottery assemblages from Zamostje 2 and Sakhtysh 2a, two hunter-gatherer settlements located in the Upper Volga region of Russia. GC-MS analysis of the lipids, extracted from the ceramics and charred residues by acidified methanol, suggests that pottery use was primarily oriented towards terrestrial and aquatic animal products. However, while many of the Early Neolithic vessels contain lipids distinctive of freshwater resources, triterpenoids are also present in high abundance suggesting mixing with plant products. When considering the isotopic criteria, we suggest that plants were a major commodity processed in pottery at this time. This is supported by the microscopic identification of Viburnum (Viburnum Opulus L.) berries in the charred deposits on several vessels from Zamostje. The study of Upper Volga pottery demonstrated the importance of using a multidisciplinary approach to determine the presence of plant resources in vessels. 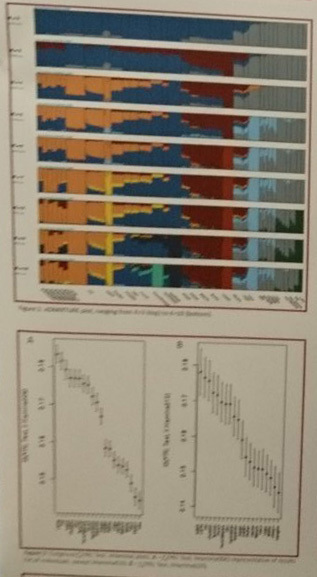 Furthermore, this informs the selection of samples, often subject to freshwater reservoir effects, for 14C dating. 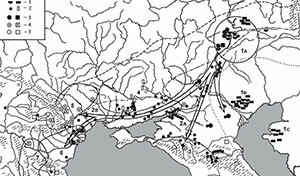 Bronze Age population dynamics and the rise of dairy pastoralism on the eastern Eurasian steppe, by Warinner et al. 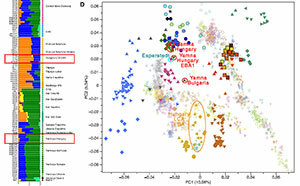 Recent paleogenomic studies have shown that migrations of Western steppe herders (WSH), beginning in the Eneolithic (ca. 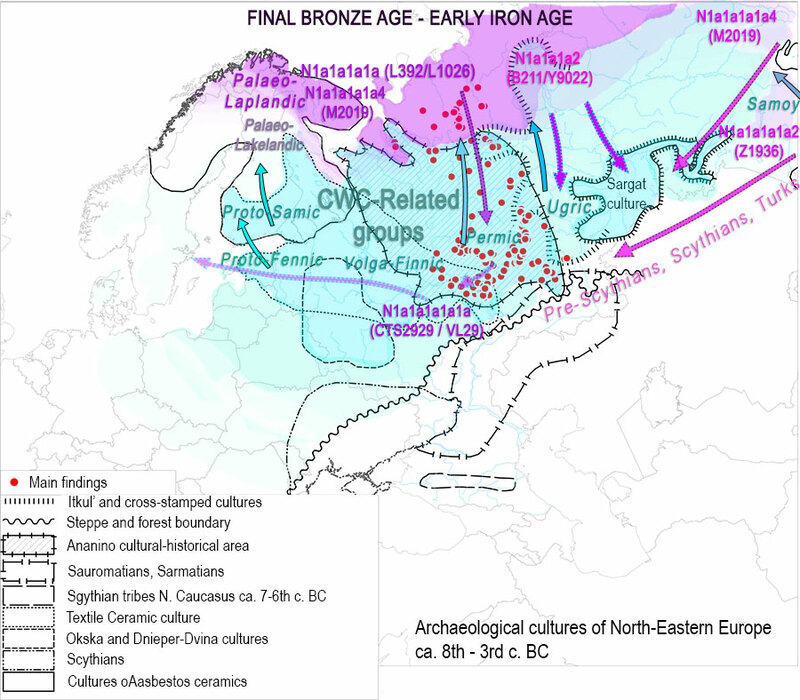 3300-2700 BCE), profoundly transformed the genes and cultures of Europe and Central Asia. Compared to Europe, the eastern extent of this WSH expansion is not well defined. 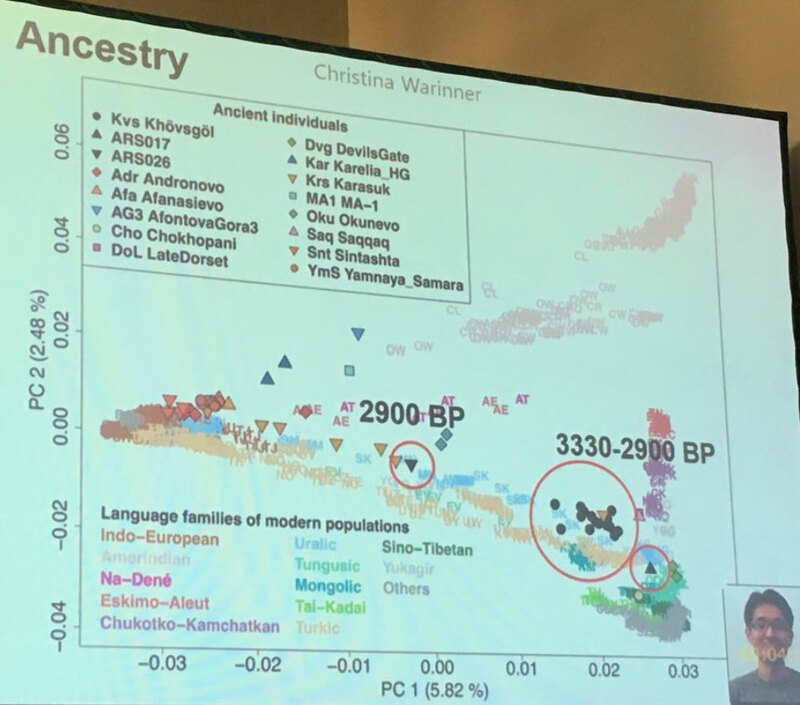 Here we present genomic and proteomic data from 22 directly dated Bronze Age khirigsuur burials from Khövsgöl, Mongolia (ca. 1380-975 BCE). 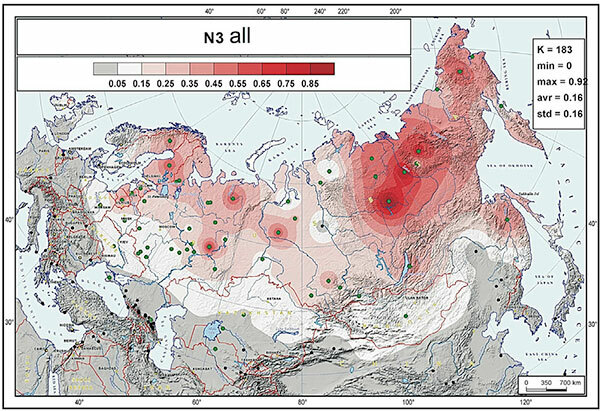 Only one individual showed evidence of WSH ancestry, despite the presence of WSH populations in the nearby Altai-Sayan region for more than a millennium. At the same time, LCMS/ MS analysis of dental calculus provides direct protein evidence of milk consumption from Western domesticated livestock in 7 of 9 individuals. 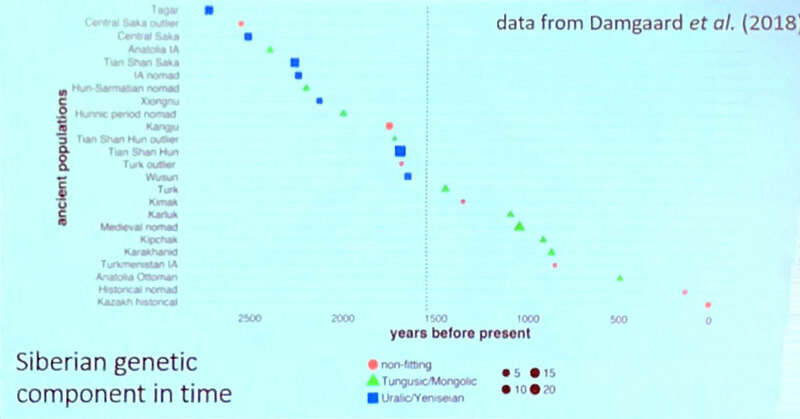 Our results show that dairy pastoralism was adopted by Bronze Age Mongolians despite minimal genetic exchange with Western steppe herders. The Keriyan, Lopnur and Dolan peoples are isolated populations with sparse numbers living in the western border desert of our country. By sequencing and typing the complete Y-chromosome of 179 individuals in these three isolated populations, all mutations and SNPs in the Y-chromosome and their corresponding haplotypes were obtained. 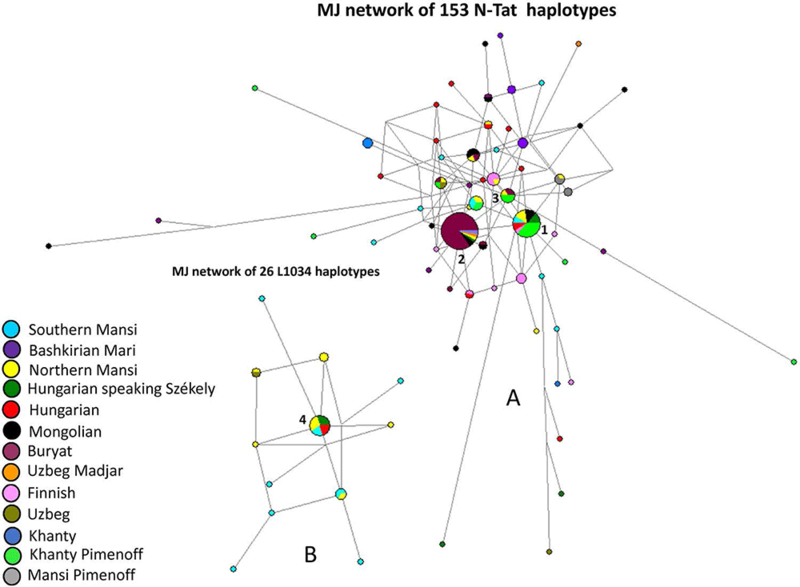 Types and frequencies of each haplotype were analyzed to investigate genetic diversity and genetic structure in the three isolated populations. 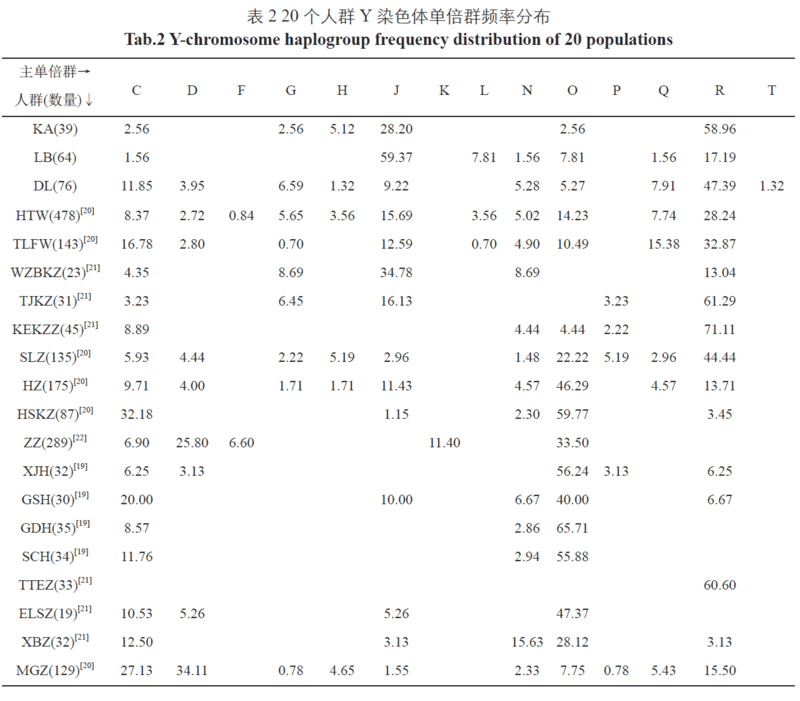 The results showed that 12 haplogroups were detected in the Keriyan with high frequencies of the J2a1b1 (25.64%), R1a1a1b2a (20.51%), R2a (17.95%) and R1a1a1b2a2 (15.38%) groups. Sixteen haplogroups were noted in the Lopnur with the following frequencies: J2a1 (43.75%), J2a2 (14.06%), R2 (9.38%) and L1c (7.81%). 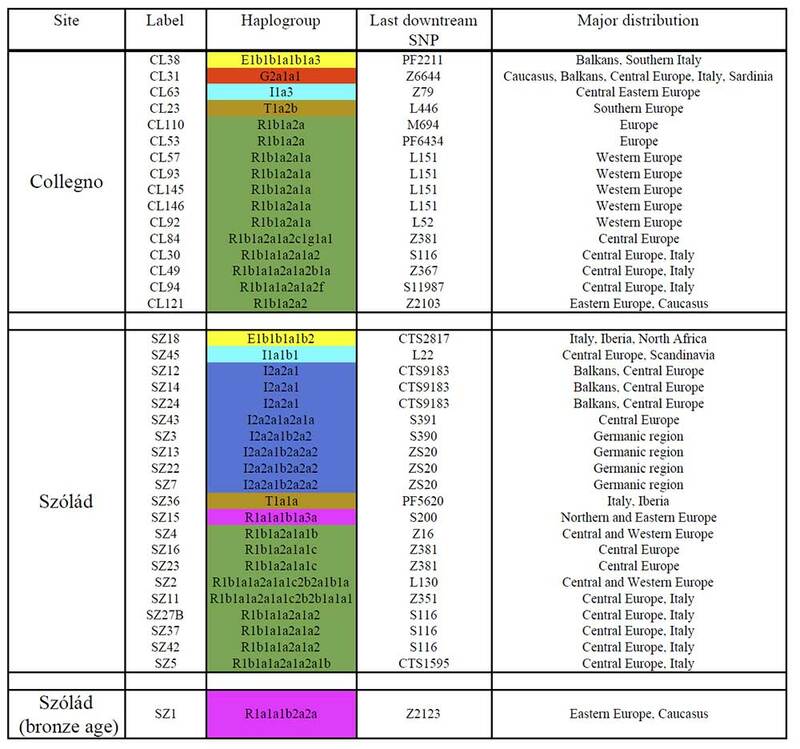 Forty haplogroups were found in the Dolan, noting the following frequencies: R1b1a1a1 (9.21%), R1a1a1b2a1a (7.89%), R1a1a1b2a2b (6.58%) and C3c1 (6.58%). 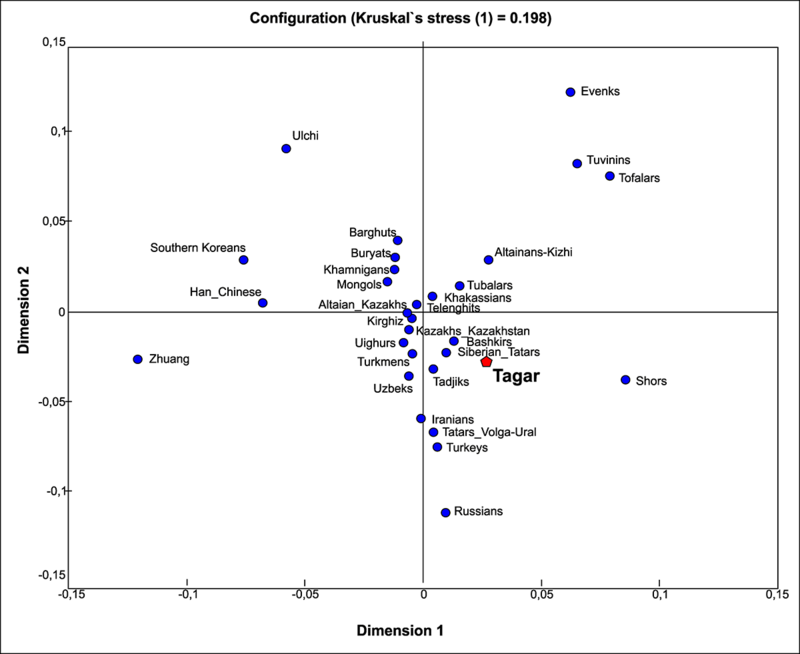 These data show that these three isolated populations have a closer genetic relationship with the Uygur, Mongolian and Sala peoples. 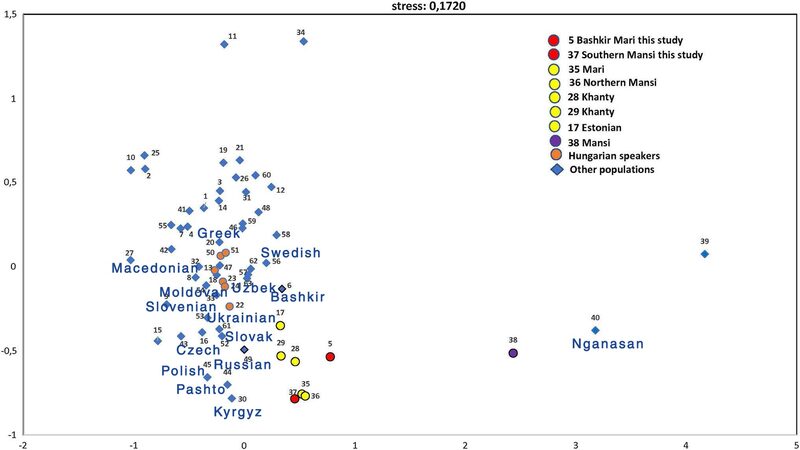 In particular, there are no significant differences in haplotype and frequency between the three isolated populations and Uygur (f=0.833, p=0.367). 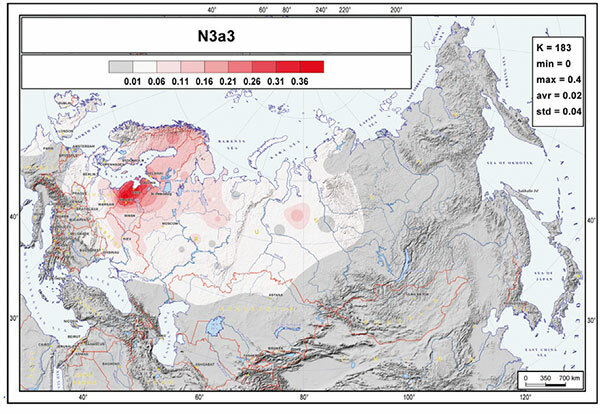 In addition, the genetic haplotypes and frequencies in the three isolated populations showed marked Eurasian mixing illustrating typical characteristics of Central Asian populations. Figure 1. The populations distribution map. Left: Uluru. Center: Dali Yabuyi. Right: Kaerqu. 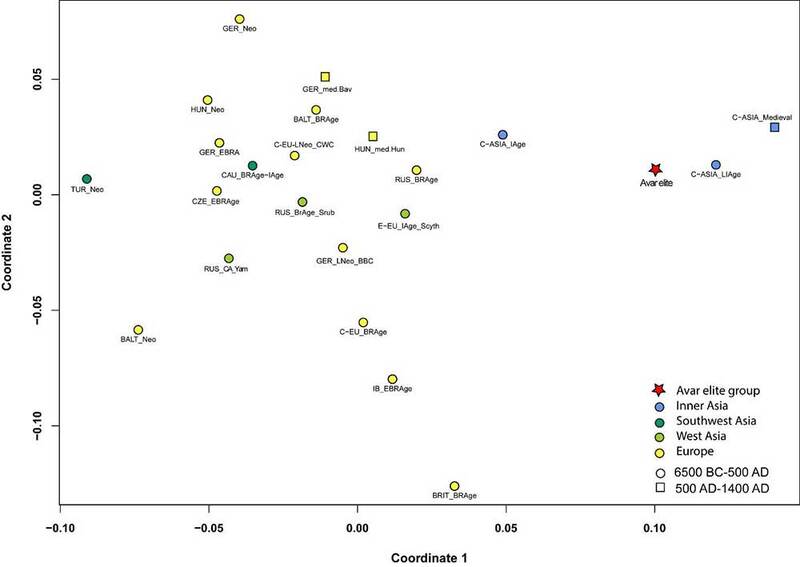 The source of 179 blood samples used in the study is shown in Figure 1. The Keriyan blood samples were collected from Dali Yabuyi Township, Yutian County (39 samples). The blood samples of the Lopnur people were collected from Kaerqu Township, Yuli County (64 cases); the blood samples of the Dolan people were collected from the town of Uluru, Awati County (76). 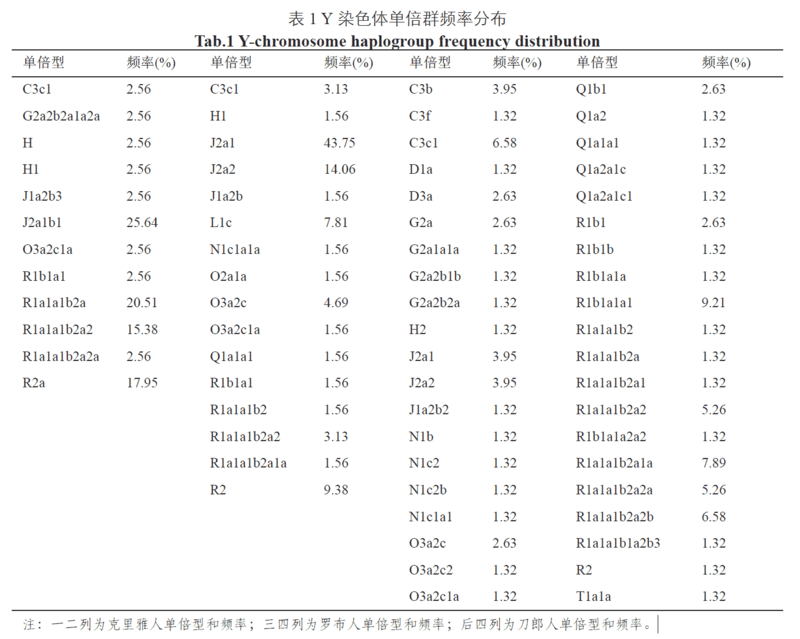 Columns one and two are the Keriyan haplotypes and frequencies, respectively; the third and fourth columns are the Lopnur haplotypes and frequencies; the last four columns are the Daolang haplotypes and frequencies. 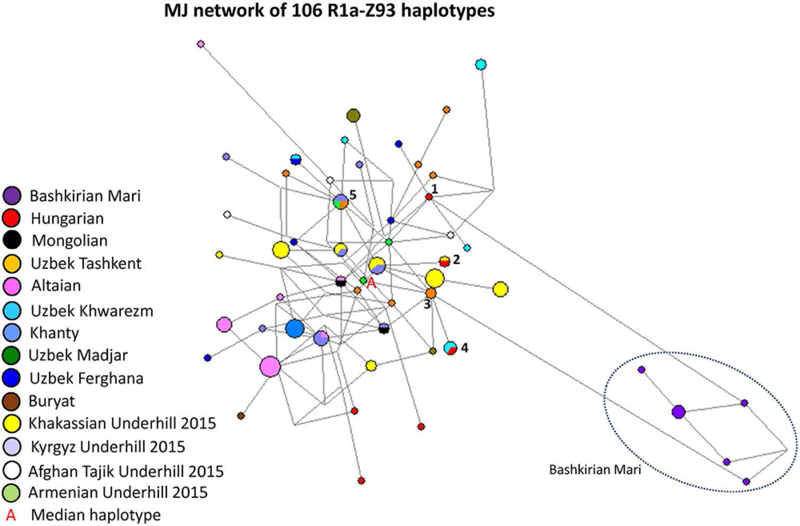 The composition and frequency of the Keriyan people’s haplogroup are closest to those of the Uighurs, and both Principal Component Analysis and Phylogenetic Tree Analysis show that their kinship is recent. We initially infer that the Keriyan are local desert indigenous people. They have a connection with the source of the Uighurs. Chen et al. studied the patriarchal and maternal genetic analysis of the Keriyan people and found that they are not descendants of the Tibetan ethnic group in the West. The Keriyan people are a mixed group of Eastern and Western Europeans, which may originate from the local Vil group. 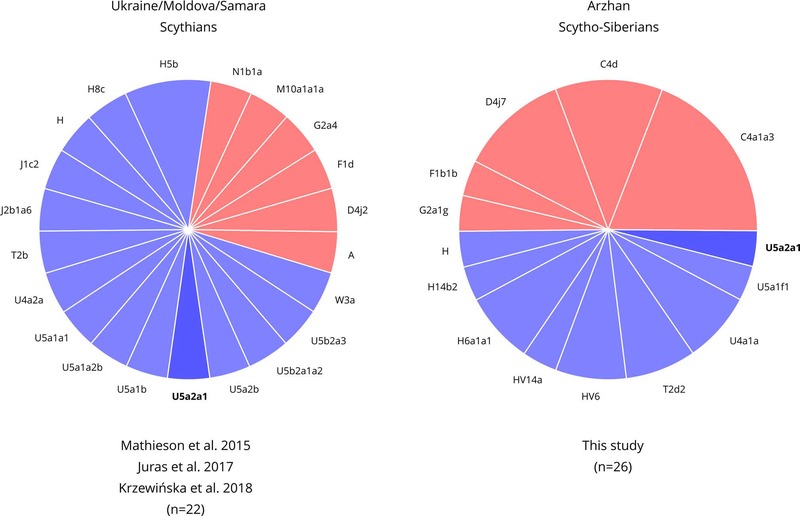 Duan Ranhui  and other studies have shown that the nucleotide variability and average nucleotide differences in the Keriyan population are between the reported Eastern and Western populations. The phylogenetic tree also shows that the populations in Central Asia are between the continental lineage of the eastern population and the European lineage of the western population, and the genetic distance between the Keriyan and the Uighurs is the closest, indicating that they have a close relationship. Regarding the origin of the Lopnur people, Purzhevski judged that it was a mixture of Mongolians and Aryans according to the physical characteristics of the Lopnur people. In 1934, the Sino-Swiss delegation discovered the famous burials of the ancient tombs in the Peacock River. After research, they were the indigenous people before the Loulan period; the researcher Yang Lan, a researcher at the Institute of Cultural Relics of the Chinese Academy of Social Sciences, said that the Lopnur people were descendants of the ancient “Landan survivors”. However, the Loulan people speaking an Indo-European language, and the Lopnur people speaking Uyghur languages contradict this; the historical materials of the Western Regions, “The Geography of the Western Regions” and “The Western Regions of the Ming Dynasty” record the Uighurs who lived in Cao Cao in the late 17th and early 18th centuries. Because of the occupation of the land by the Junggar nobles and their oppression, they fled. Some of them were forced to move to the Lop Nur area. 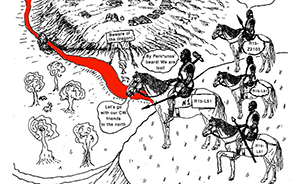 There are many similar archaeological discoveries and historical records. We have no way to determine their accuracy, but they are at different times, and there is a great difference in what is heard in the same region. (…) The genetic characteristics of modern Lopnur people are the result of the long-term ethnic integration of Uyghurs, Mongols, and Europeans. 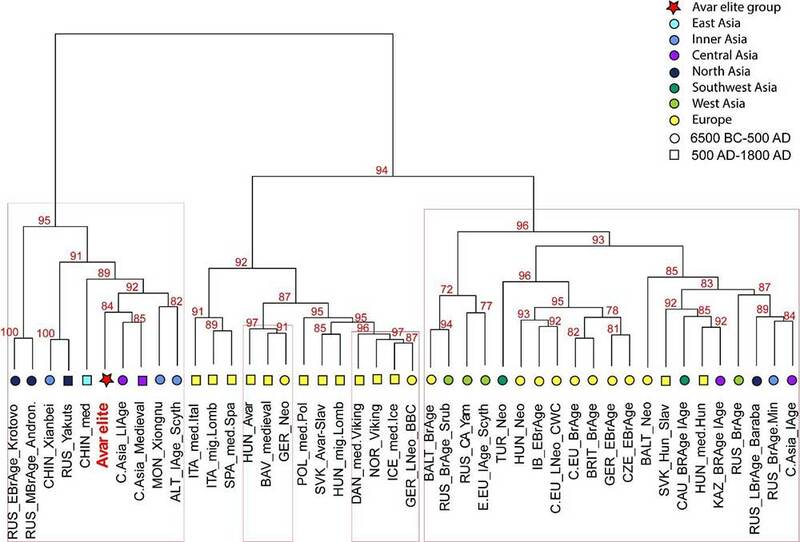 This is also consistent with the similarity of the genetic structure of the Y chromosome of Lopnur in this study with the Uighurs and Mongolians. 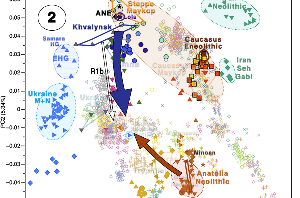 For example, the frequency of J haplogroup is as high as 59.37%, while J and its downstream sub-haplogroup are mainly distributed in western Europe, West Asia and Central Asia; the frequency of O, R haplogroup is close to that of Mongolians. 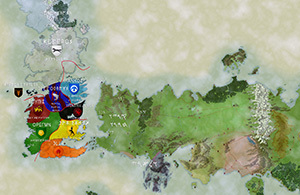 1) KA: Keriya, LB: Rob, DL: Daolang, HTW: Hetian Uygur, HTWZ: and Uygur, TLFW: Turpan Uighur, HZ: Hui, HSKZ: Kazakh, WZBKZ: Wuhuan Others, TJKZ: Tajik, KEKZZ: Kirgiz, TTEZ: Tatar, ELSZ: Russian XBZ: Xibo, MGZ: Mongolian, SLZ: Salar, XJH: Xinjiang Han, GSH: Gansu Han, GDH: Guangdong Han SCH: Sichuan Han. 2) Reference population data source literature 19-22. After the population names in the table have been marked, all the shorthands in the text are referred to in this table. 3) Because the degree of haplotypes of each reference population is different to each sub-group branch, the sub-group branches under the same haplogroup are merged when the population haplogroup data is aggregated, for example: for haplogroup G Some people are divided into G1a and G2a levels, others are assigned to G1, G2, and G3, while some people can only determine G this time. Therefore, each subgroup is merged into a single group G.
According to Ming History·Western Biography, the Mongolians originated from the Mobei Plateau and later ruled Asia and Eastern Europe. Mongolia was established, and large areas of southern Xinjiang and Central Asia were included. 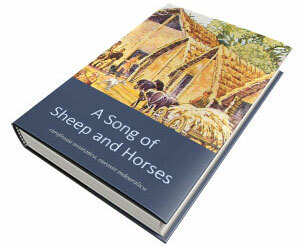 Later, due to the Mongolian king’s struggle for power, it fell into a long-term conflict. People of the land fled to avoid the war, and the uninhabited plain of the lower reaches of the Yarkant River naturally became a good place to live. People from all over the world gathered together and called themselves “Dura” and changed to “Dang Lang”. The long-term local Uyghur exchanges that entered the southern Mongolian monks and “Dura” were gradually assimilated . According to the report, locals wore Mongolian clothes, especially women who still maintained a Mongolian face . In 1976, the robes and waistbands found in the ancient time of the Daolang people in Awati County were very similar to those of the ancients. Dalang Muqam is an important part of Daolang culture. It is also a part of the Uyghur Twelve Muqam, and it retains the ancient Western culture, but it also contains a larger Mongolian culture and relics. 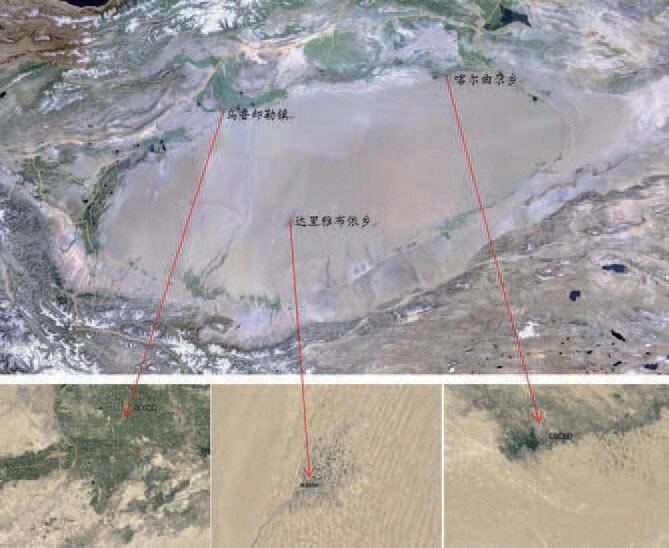 The above historical records show that the Daolang people should appear in the Chagatai Khanate and be formed by the integration of Mongolian and Uighur ethnic groups. 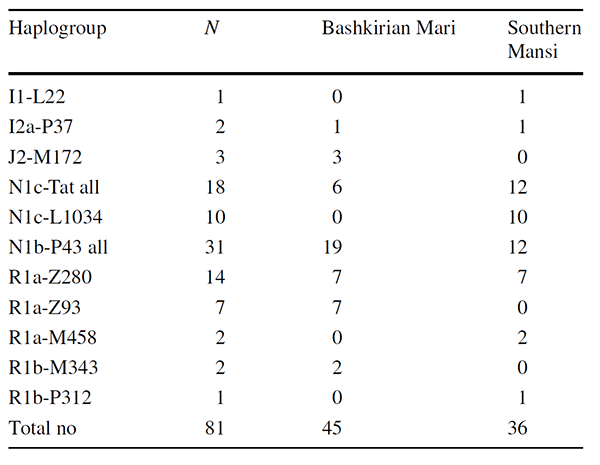 Through our research, we also found that the paternal haplotype of the Daolang people is contained in both Uygur and Mongolian, and the main haplogroups are the same, whereas the frequencies are different (see Table 3). The principal component analysis and the NJ analysis are also the same. It is very close to the Uyghur and the Mongolian people, which establishes new evidence for the “mixed theory” in molecular genetics. 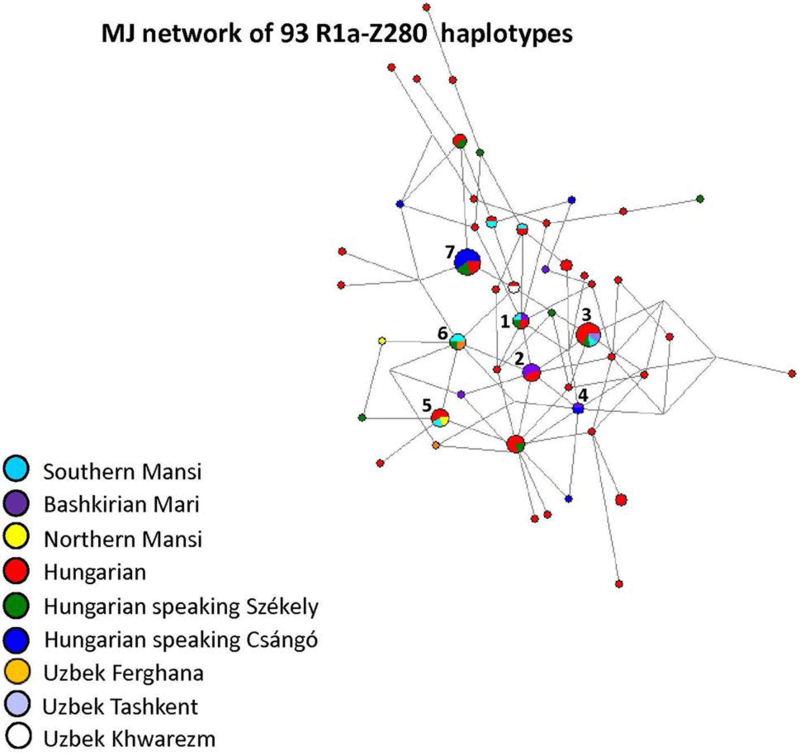 Genetic relationship between the three isolated populations: the Uygur and the Mongolian is the closest, and the main haplogroup can more intuitively compare the source composition of the genetic structure of each population. Haplogroups C, D, and O are mainly distributed in Asia as the East Asian characteristic haplogroup; haplogroups G, J, and R are mainly distributed in continental Europe, and the high frequency distribution is in Europe and Central Asia. 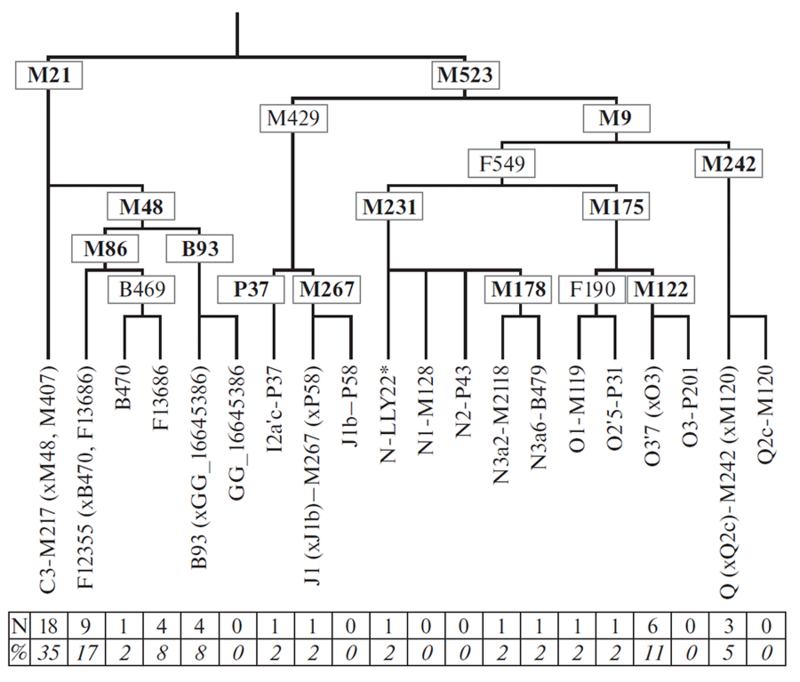 The presence of exclusively R1a-Z93 subclades and the lack of R1b-M269 samples is compatible with the expansion of R1a-Z93 into the area with Proto-Tocharians, at the turn of the 3rd-2nd millennium BC, as suggested by the Xiaohe samples, supposedly R1a(xZ93). 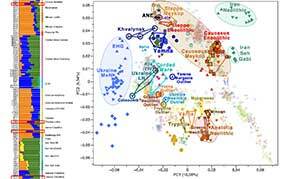 Now that it is obvious from ancient DNA (as it was clear from linguistics) that Pre-Tocharians separated earlier than other Late PIE peoples, with the expansion of late Khvalynsk/Repin into the Altai, at the end of the 4th millennium, these prevalent R1a (probably Z93) samples may be showing a replacement of Pre-Tocharian Y-DNA with the Andronovo expansion already by 2000 BC. *NOTE. The presence of R1b-M269 among Proto-Tocharians, as well as the presence of R1b-M269 among Tarim Basin peoples in modern and ancient times is not yet fully discarded. The prevalence of R1a-Z93 may also be the sign of a more recent replacement by Iranian peoples, before the Mongolian and Turkic expansions that probably brought R1b(xM269). 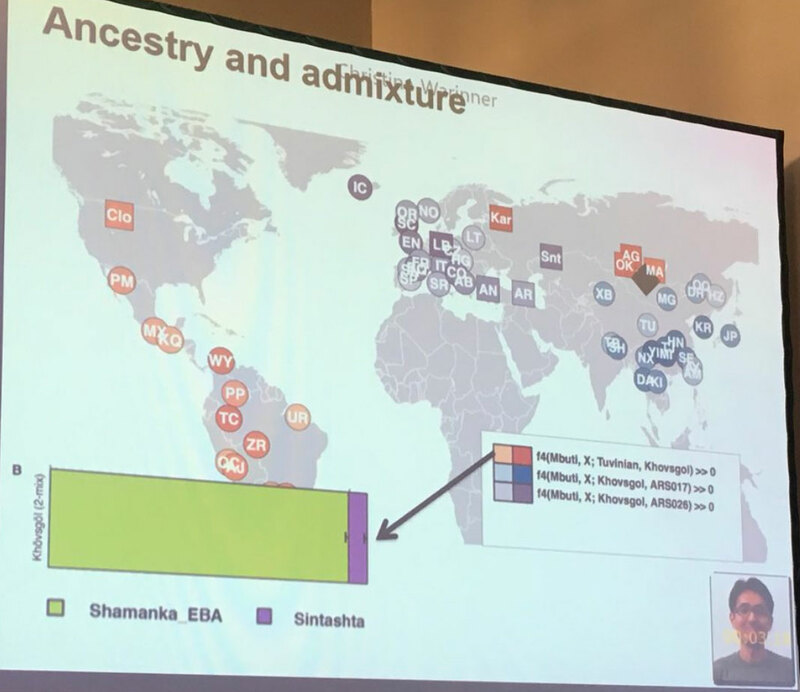 Also, the presence of R1b (xM269) samples in east Asia strengthens the hypothesis of a back-migration of R1b-P297 subclades, from Northern Europe to the east, into the Lake Baikal area, during the Early Mesolithic, as found in the Botai samples and later also in Turkic populations – which are the most likely source of these subclades (and probably also of Q1a2 and N1c) in the region.